Glaucoma is one of the leading causes of blindness throughout the world affecting millions of people. 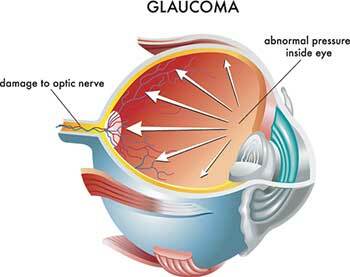 Glaucoma is a disease of the eye that causes damage to the optic nerve. The optic nerve is the pathway that carries the images we see to the brain. If left untreated, the disease can destroy the optic nerve leading to loss of vision. To date, with proper medical care, glaucoma may be treated and controlled. Since most people with glaucoma experience no noticeable symptoms, an eye examination for glaucoma, including specialized testing, is the most important tool in preventing vision loss from the disease. During your exam, your doctors may determine that a visual field test is necessary as well as a scan of the optic nerve to assess its health. Optical Coherence Tomography (OCT) is a system that combines a laser-scanning camera and specialized software that evaluates the optic nerve. The OCT may diagnose glaucoma years before symptoms become apparent to the patient. The OCT gives measurements of size, depth and shape of the optic nerve and is especially useful at detecting small changes over time. In most instances prescription eyedrops are used to control glaucoma. The goal of therapy is to reduce the eye pressure that contributes to optic nerve damage. In the event that eyedrops are not adequate or have unwanted side-effects, surgical treatment may be necessary. Selective Laser Trabeculoplasty (SLT) is a safe and effective in office procedure that can be a very useful adjunct to glaucoma therapy. SLT is not appropriate for all patients with glaucoma so your doctor will have to determine if you are a candidate. The effect is not usually permanent but can be repeated as needed in most cases. For patients with glaucoma who need cataract surgery, an iStent can be inserted at the time of cataract surgery to improve control of glaucoma. This microscopic device is implanted in the eye and serves to shunt fluid from the eye in order to lower pressure. In more advanced cases of uncontrolled glaucoma, a surgical shunt or tube may be necessary to lower the eye pressure. The most effective way of managing glaucoma is by early detection. So regular eye exams are your best defense against permanent disabling vision loss.